The idea of a legacy project as a new medium-term goal for Te Ara Kākāriki was presented. The project would ideally be six hectares, which is much larger than anything the trust has worked on before and would likely be achieved in partnership with other organisations and funders. Ideally, these larger size Greendots are spaced every five kilometres across the Canterbury plains, as theorised by local ecologists Meurk and Hall. Guests were encouraged to share ideas with the trust on suitable land or adjacent properties for the project. Keynote speaker Libby Harrison spoke of Zealandia Ecosanctuary’s success introducing several bird species back to Wellington City as something that could be achieved by Te Ara Kākāriki with a legacy project in Canterbury. Libby, Deputy Chair of World Wildlife Fund (WWF) NZ, praised attendees for getting involved in local conservation projects. Emphasising the fact that New Zealand’s ecosystems are unique, and many are threatened, Libby spoke of WWF’s history of focusing on endangered species and how the organisation has changed to now include greater biodiversity and ecosystems as a priority. Libby highlighted a recent WWF project introducing blockchain technology to the fishing industry. This allows traceability of fish from the sea to the supermarket enabling consumers to make informed choices and eliminate illegal fishing. Five dedicated and praiseworthy landowners applied for this year’s Diana Isaac Cup. The cup which was personally chosen by the late Lady Diana Isaac is awarded every two years. 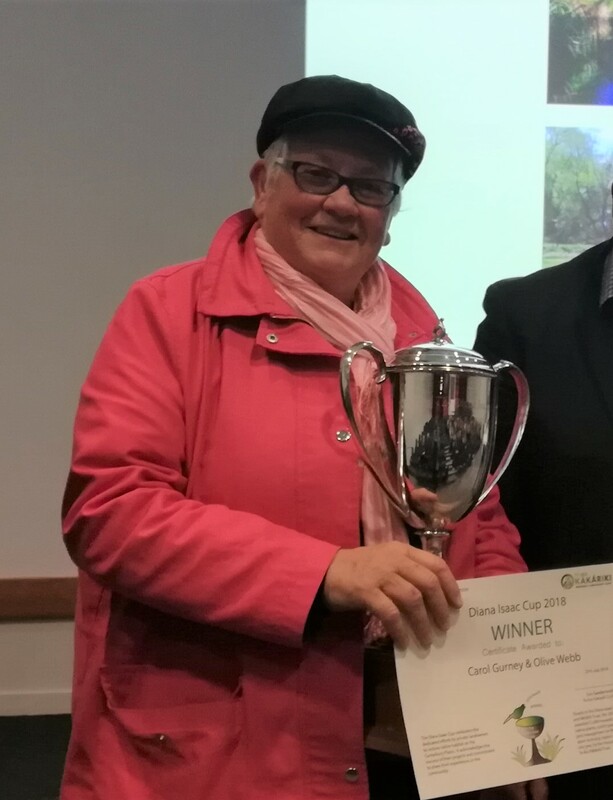 Bruce Rule and Catherine Ott of The Isaac Conservation and Wildlife Trust announced Olive Webb and Carol Gurney as 2018 winners of the cup and the $1000 prize money to go towards further plantings. The winning Greendot of over 3000 native plants stood out for its well restored stream, encouraging native mudfish habitat and a wetland restoration area in process. Olive shared her pleasure that her original plantings were now over three meters tall and the waterway had transformed from “dirty” to a beautiful environment which her grandchildren now play in. TAK trustee Johannes Welsch recalled receiving an email from Olive sharing her delight at spotting a native Kākāriki fly over their property. Their commitment to sharing their passion with the community was also acknowledged as they often give tours of the property to people popping in, and consequently several neighbours and friends are eager to undertake similar projects returning their land to native landscape. 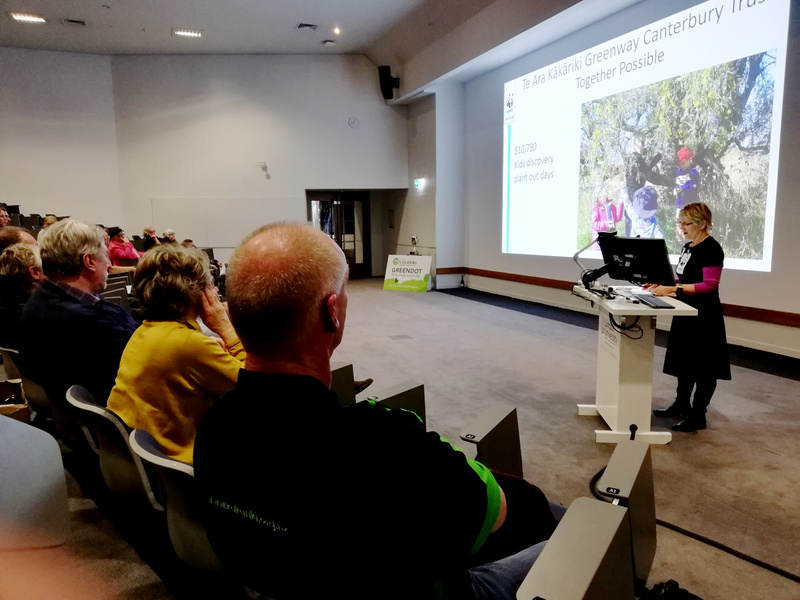 Bruce updated guests on The Isaac Conservation and Wildlife Trust’s successful Kākāriki breeding programme and recent release of some of their birds. He also encouraged guests to visit the Isaac Conservation Park and check out the walking tracks around the park. The Isaac Conservation and Wildlife Trust assists Te Ara Kākāriki with ongoing funding towards our planting days.